The Treatment have released a video for their track Let It Begin with TeamRock. 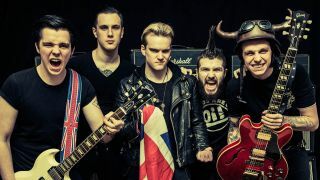 It’s lifted from the UK outfit’s upcoming album Generation Me – out on March 18 via Frontiers Music SRL. It’ll be the group’s first record with frontman Mitchel Emms and guitarist Tao Grey. They’ve also announced a UK tour, plus dates in Italy and Denmark later this year. The Amorettes will be special guests on all UK shows. Grey tells TeamRock: “We can’t tell you how excited we are to finally unleash Generation Me on the rock community. Generation Me is the follow up to 2014’s Running With The Dogs and was produced by Laurie Mansworth. The lineup is completed by guitarist Tagore Grey, drummer Dhani Mansworth and bassist Rick ‘Swoggle’ Newman.